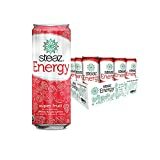 Steaz Organic Energy Drink is an all natural drink containing acai berry, green tea, guarana and all natural cane juice as a sweetener. All flavors of Steaz have the same caffeine content. 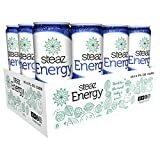 Besides energy drinks, Steaz also makes a line of Iced Green Teas, Sparkling Green Teas, and an energy shot. Steaz Energy shot has 150mg of caffeine per 2.5 fl oz bottle. 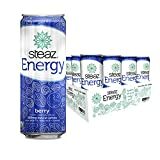 I recently received Steaz Energy Drink, the can says organic, so that usually means the taste will leave you thirsting for something else, yet we must be fair, so lets give Steaz Berry a fair shot, ok? As I pop the top, I get a very nice aroma from the large mouth on the top. As for the taste, the can says contains Green Tea, and boy does it. I didn’t find any berry taste, but a carbonated very much green tea taste. Not to carbonated, almost a watered down carbonation, yet the taste of Steaz is dominated by the green tea. I personally, am not a big fan of green tea, yet the taste wasn’t a turnoff. If you love the green tea, you will adore this drink, yet even if your not, the flavor shouldn’t be enough to prevent you from finishing the can. As for ingredients, I could actually pronounce all of its ingredients listed on the can, some of which are organic acai berry juice, organic cane juice, organic green tea and natural berry flavor. Also including 34 grams of sugar and organic guarana extract. The caffeine content clocks in at 100mg. As for the effect of Steaz Organic Energy Drink, just as the taste was average, the effect was average at best. I felt a slight increase in my energy level, yet nothing that would sustain me through a long day at the office. Mirrors the taste, nothing special. 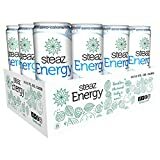 In many of my energy drink review journeys, the word organic on the can usually means noting special inside, and that’s just what I found with the Steaz Energy. The taste wasn’t good, yet wasn’t that bad either and the energy it provided was there, but nothing to write home about. So I guess the best description I can give Steaz Organic Energy Drink would be its as blah as an energy drink gets. Sugar content: 34 grams (per 12 ounces). Steaz Organic Energy Drink contains 8.33 mgs of caffeine per fluid ounce (28.18mg/100 ml).